Employees’ Provident Fund (EPF) is a saving tool that we all like not only because it gives guaranteed tax-free returns but also because we know that our employer adds an equal amount to the PF kitty every month. But what if your PF account statement does not reflect your employer’s contribution or the interest on that bit? Last month, Mint reported that the government found nearly 300 companies running their own PF trusts flouting rules and may not be paying interest to their employees. There are many companies that are exempted from contributing to the trust managed by the Employees’ Provident Fund Organisation (EPFO) and have their own PF trusts that are privately managed. Currently, there are more than 1,500 companies that operate their own PF trusts. Some of the big companies that operate their own PF trust include Nestle India Ltd, HDFC Ltd, Glaxo (I) Ltd, Godrej Industries Ltd and Steel Authority of India. “Major corporates continue to have in-house PF trust because they feel that it is more employee friendly and also a matter of prestige," said Sandeep Shah, partner, NA Shah Associates LLP, a chartered accountancy firm. There are other reasons too. “Traditionally, private trusts used to invest in government securities and units of mutual funds which provided for better earnings vis-a-vis the earnings generated through EPFO. This provided leverage to corporates to provide better returns to employees," said Saraswathi Kasturirangan, partner, Deloitte India. Further, in-house PF trusts facilitated employees in obtaining advance from the PF account or withdrawing it early. “Employees were also comfortable since they had transparency with respect to the balance in their accounts," added Kasturirangan. The cost of managing funds is another factor because of which companies choose to operate their own PF trust instead of opting for EPFO. “Inspection charges of 0.18% apply for a private trust as compared to administration charges of 0.5% prevailing currently in the EPFO-administered model," said Kasturirangan. Though there are reasons why many companies choose to operate their own PF trust, there are questions about proper management of the fund. Many companies have been accused of misusing employees’ PF fund corpus as their own working capital. An employee needs to be watchful while going through the salary slip and should keep an eye on the PF account statement as well. “The in-house PF trust has to make available the online facility for the members to view their account on lines similar to EPFO. Also, in-house PF trusts are mandated to circulate PF statements to employees and maintain proof of having sent the statement," said Shah. 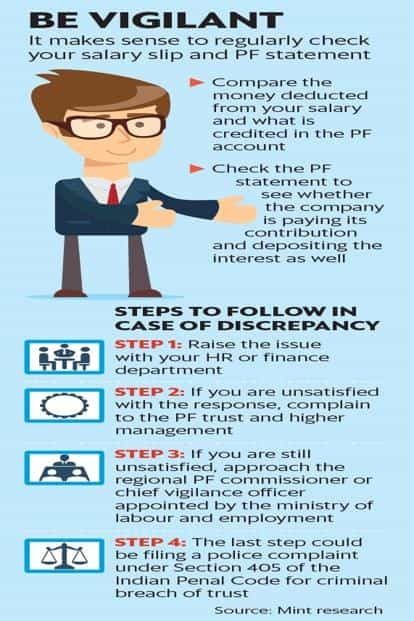 In case an employee finds any discrepancy in the PF statement, she should raise the issue with the employer. “The employee should write to the PF trustees listing out the discrepancy. Considering the stringent action taken by the PF authorities for non-address of complaints (through their annual audit) by the in-house PF trust, it is unlikely that the complaint of the employee will go unaddressed. The managing director of the company is liable for non-compliance and hence such complaints are addressed swiftly. Also, non-adherence to this aspect can result in exemption of the in-house PF trust being withdrawn," said Shah. A discrepancy could also arise because of delay in transfer of funds or some clerical error. But in case the issue is contentious and the employer is not concerned about resolving it, you can escalate the grievance. “The employee can raise the matter with the Regional Provident Fund Commissioner," said Kasturirangan. The employee also has the option to file an online complaint with the EPFO against the employer. “The complaint can be registered through the grievance website using the Universal Account Number (UAN) which is mandatory even for the employees of in-house private trust. As per protocol, the complaint should be resolved within 30 days and can also be tracked online," said Shah. Time and again, EPFO has laid down guidelines to be followed by exempted companies which operate their own PF trusts. All such companies are required to file statutory PF returns each month and after evaluating performance based on—transfer of funds before due date, investment, remittance to the trust, interest declared, claims settlement and audit of account—EPFO ranks companies and publishes the ranking on the website. While EPFO is doing its job, employees too need to be careful about their account.